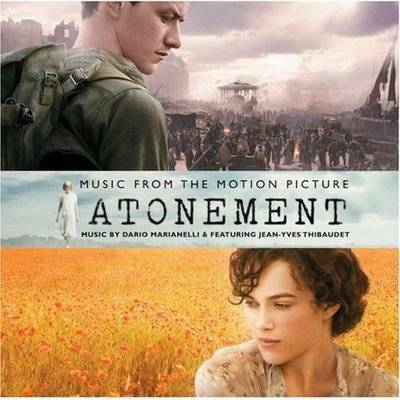 A romantic drama based on the acclaimed 2001 novel by Ian McEwan, Joe Wright’s film Atonement is a period drama about lies, regret, and redemption. Keira Knightly and James McAvoy star as Cecilia and Robbie, two young lovers in 1930s England whose blossoming relationship is halted by the intervention of Cecilia’s 13-year-old sister Briony (Saoirse Ronan), who accuses Robbie of a heinous crime – but is he guilty, or simply the victim of a young girl’s fantasy? As a result their two lives diverge: Robbie becomes a soldier, fighting on the beaches of Dunkirk in World War 2, while Cecilia becomes a nurse caring for the sick and injured returning from the trenches. Briony, meanwhile, grows up to become a successful novelist – but is continually haunted by the consequences of her childhood actions. Scoring this complicated tale of tragic love is Italian composer Dario Marianelli, who received critical acclaim and an Oscar nomination for his score for Joe Wright’s previous film Pride & Prejudice in 2005, and whose work in recent years on films such as The Brothers Grimm, V for Vendetta and The Brave One has thrust him into the film scoring limelight. Once again, Marianelli’s choice was to have piano and strings as the lead instruments, and adopt a gently romantic tone and a soft pace to underscore the emotional core of the score. Jean-Yves Thibaudet, the virtuoso French concert pianist, returns to being his classical delicacy to the piano performances, resulting in a score which is, by turns, beautiful, romantic, and filled with wistful longing. Marianelli’s gimmick in Atonement is to have a typewriter as part of the percussion section, clearly as a reflection of Briony’s occupation as a novelist, and to underline the point that literary fantasy is a key plot element in the film. The percussive clatter of the keys initiates and underpins the central theme for Briony, which is heard in the opening cue “Briony”, and in later tracks such as “Two Figures by a Fountain”, “With My Own Eyes”, the more urgent and dramatic “Cee, You and Tea”, and the surprising “Come Back” which, amongst other things, also features a performance of the wartime standard ‘The White Cliffs of Dover’, and a church organ solo. The vivacious piano line and prancing string work gives the theme energy and a sense of wit and sprightliness which is quite delightful. The World War 2 element, underscoring Robbie’s odyssey into the heart of wartime darkness, sees the music plumb its darkest depths, notably through the increased use of brass in the bold and powerful “The Half Killed”. The stunning, ghostly “Elegy for Dunkirk” is probably the high point of the entire score, notably for its subtle, almost subliminal inclusion of a choral element which eventually emerges into a performance of the old hymn “Dear Lord and Father of Mankind” in counterpoint with Dale’s mesmerizing cello tones. The rest of the score, for the most part, adopts a generally romantic tone, highlighting particular soloists in the English Chamber Orchestra. “Robbie’s Note” features a delicate, swooning oboe element which gradually emerges into a rhapsodic piano motif that bathes in verdant romance, while Caroline Dale’s expressive, melancholy, weeping cellos feature prominently in “Farewell” and the heartbreakingly beautiful “Love Letters”, another score highlight. Everything comes to a head in the conclusive trio of “Denouement”, “The Cottage on the Beach”, and “Atonement”, into which Marianelli brings an impressive sweep, capturing the both the lost love that Robbie and Cecilia were destined not to share, and bitter sadness of Briony’s lifelong regrets. These ten minutes stand as some of the finest film music written in all of 2007. Over the last few years, Dario Marianelli has developed into a truly accomplished film composer with an impressive body of work and a bright future ahead of him. At the time of writing, Atonement has been nominated for a Golden Globe Award, and looks set to be a lock for a 2007 Academy Award nomination – and I wouldn’t be surprised if wins. Music composed by Dario Marianelli. Conducted by Benjamin Wallfisch. Performed by The English Chamber Orchestra. Orchestrations by Dario Marianelli and Benjamin Wallfisch. Featured musical soloists Jean-Yves Thibaudet, Caroline Dale and Brendan Power. Recorded and mixed by Nick Wollage. Edited by James Bellamy. Album produced by Dario Marianelli.